Today we go on some more random winter explorations of Huntingdon County and Raystown Lake Region. We spent the night at the beautiful and affordable Rooster's Retreat Bed and Breakfast. We start off at the former Broad Top City Railroad Station, which has been relocated to Dudley, along with this old ALCO locomotive, which is said to have served the Duquesne Slag Company and Hammermill. It is not operational, though it makes for a nice display next the old Broad Top City train station. The Rockhill Trolley Museum, and remnants from the old East Broad Top Railroad operations are located nearby. This switcher locomotive appears to have been repainted relatively recently. The old station is also painted brightly. The locomotive is an ALCO 0-4-0 switcher that dates back to 1922. Once it was retired from service hauling slag from the steel plants in Pittsburgh, it was sold to Hammermill Paper at some point, and then later sold to Sloan Cornell who would go on to create the former Penn View Mountain Railroad, which was once in Blairsville, PA. Now the locomotive resides inoperable as a reminder of the Broad Top and Huntingdon Railroad that once traversed the region. 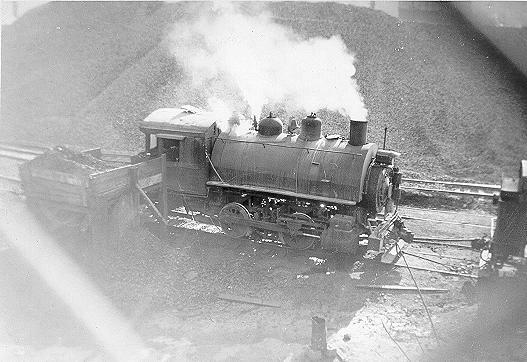 This photo from rr-fallenflags.org shows what is believed to be a photo of this locomotive in operation while used by Duquesne Slag in Pittsburgh. Notice the giant piles of slag surrounding the locomotive. This photo was likely taken in the area around Glenwood, Pittsburgh, where large portions of slag from steel production was dumped. This slag was filled all the way up the valley there, into what is now Frick Park, up to around the Squirrel Hill Tunnel on the Parkway. The upscale housing development, Summerset at Frick Park, was built atop the giant slag heap. Other massive slag heaps can be found in West Mifflin at Century 3 Mall, around Clairton and pretty much any other place that currently hosts, or once hosted, large steel mills/coke works. An antique water tower and freight station, relocated from nearby Broad Top City, accompany the locomotive. The location is also home to a memorial for veterans from the community. Our next stop takes us to Warriors Path State Park, which gives panoramic views of the Juniata River Valley as it heads into Raystown Lake. At the smaller end of Raystown Lake, with it frozen to the point that there was even an ice fisherman out there. Raystown Lake's James Creek Boat Launch. The roadways around this area often involve these neat cuts into the rocks. We headed eastward on Route 164, heading out of Huntingdon County, and briefly into Bedford, and then into Blair County. This stretch is absolutely beautiful, and the Mid State Hiking Trail goes right across the ridge of Tussey Mountain. This impressive route provides stunning views through its quick ascent and descent across the ridge. The highest point on this road is roughly 2000 feet, and the lowest points within view are roughly 800 feet in elevation, meaning that you get a view that is roughly 1200 feet above the lowest point. The views are breathtaking. The Mid State Trail runs across the Tussey Mountain Ridge. The trail runs for over 323 miles between southern Bedford County at the Maryland border, through northern Tioga County at the border with New York. This area comprises one of the most scenic portions of the trail. The Standing Stone Trail, with places such as the Thousand Steps and the Throne Room and Hall of the Mountain King, is also in the region and that is certainly one of the finest and most challenging trails that I have ever had the pleasure to hike. Trough Creek State Park also offers some nice hiking opportunities. On this visit we stayed at the beautiful and affordable Rooster Retreat Bed and Breakfast. We have also stayed at the elegant Gage Mansion Bed and Breakfast, which we also highly recommend. The Raystown Lake Region and immediate surrounding area are so beautiful and we highly recommend taking time to explore it.